Elin Améen belongs to the generation of female authors writing in the 1880s. She released about ten publications, with a focus on novellas. 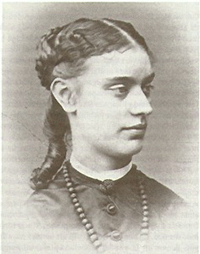 Elin Améen was born in Karlskrona in 1852. Her father, Georg Améen, hailed from the town and was a well-known functionary. He was the publisher of Najaden, a liberal newspaper, from 1838 to 1852. When Georg Améen was appointed new roles within the naval defence service and the general postal service in 1853 the family moved to Stockholm. From 1860 onwards Georg Améen served as the director of the post office in Gothenburg, and following his retirement in 1876 the family moved to Södertälje in 1878. Georg Améen died in Stockholm in 1898, and his daughter Elin Améen and his widow Vilhelmina remained there until the latter died in 1903. Elin Améen spent the last ten years of her life alone, struggling with the poor health she had suffered throughout her life. Elin Améen’s first book, entitled Träldom och andra berättelser och skisser, was released by Albert Bonnier publishers in 1885. It comprised a number of sketches and stories. She had no major public success with it and the publication was actually a financial loss for Bonnier, according to a letter from Albert Bonnier to the author. The novella “Träldom” tells the story of a poor and orphaned young woman who, due to being penniless and uneducated, is forced to work as a companion for an elderly lady. She dreams of travelling to Paris but lends her savings to her brother to get him out of trouble, and is then unable to break free from servitude. The collection also includes “Konstnärinna och qvinna”, a novella typical of its era, reflecting the dream of unifying love and artistic expression. Despite its poor sales, this debute must have made some kind of impact because Elin Améen, then just 30 years old, was accepted into Stockholm’s cultural elite. In 1886 she was elected into the Nya Idun society, a newly established women’s association. The earliest members of the society included Alfhild Agrell, Amanda Kerfstedt, Anne Charlotte Leffler, Mathilda Roos and Anna Whitlock. Elin Améen thus became incorporated among the better-known women of Stockholm. However, it was not until 1891 that she had another piece of work published. This time she chose Per Huldberg as the publisher for Lifsmål, which also was a compilation of stories and sketches. In 1891 Elin Améen published the novella “Befriad” in the newspaper Ur dagens krönika. It was also included in Lifsmål. A review of the novella was published in the British magazine Review of Reviews. The esteemed American actress Elizabeth Robins read the review and became so enthused with it that she had it translated and dramatized. Elizabeth Robins played the title role in the resulting play Alan’s Wife, which was performed at The Independent Theatre in London in 1893. Elin Améen then translated the play into Swedish and called it a “dramatic study of a sketch”. The play, entitled En Moder, was published in 1895 by Bonnier as part of their theatre library, but it was not until 1903 that the play premiered at Kungliga Dramatiska Teatern in Stockholm. The play tells the gloomy tale of a working-class family, where the woman loses her husband in a work accident, and subsequently gives birth to a son who is severely handicapped. In desperation she smothers the new-born, and is then imprisoned after admitting her deed. Elin Améen’s story Frihet was included in Iduns romanbibliotek of 1893, and her book “Bergtagen” och andra berättelser was released by Beijer publishers in 1898. The fact that she changed publisher implies that Elin Améen was unable to take hold on the book market. Margareta, 1912, was published as a 25 öre book by Nordiska förlaget, who also released En sommardröm in its 10 öre series, as well as En sommarsaga in the same year. Grevinnan Dora and Skilsmässa were published in 1914 as 25 öre books, also by Nordiska förlaget, as part of their ladies’ library. Elin Améen’s writings thus gradually moved to less prestigious publishing houses and came to be included in the popular circuit. When writing for various newspapers and journals, such as Dagny, Förr och nu, Idun, Göteborgs Handels- och Sjöfarts-Tidning, Stockholms Dagblad, Vårt Land, and Svenska familj-journalen Elin Améen published under the names E.A., Elisa, Lina and M-n. It is difficult to get a complete picture of just how comprehensive this output was, but Elin Améen’s writings probably served to contribute somewhat to the family earnings. Elin Améen’s first novella “Träldom” was included in Birgitta Ney’s compilation of modern breakthrough female writers entitled Synd, 1993. Synd also included works by Alfhild Agrell, Anne Charlotte Leffler, Amanda Kerfstedt, Mathilda Malling, Victoria Benedictsson and Hilma Angered-Strandberg. Although Elin Améen never had a major public breakthrough or attained an exalted status as author during her lifetime, it is still appropriate to identify her as belonging to this group. Elin Améen died in Stockholm in 1913. Elin Améen, www.skbl.se/sv/artikel/ElinAmeen, Svenskt kvinnobiografiskt lexikon (article by Gunnel Furuland), retrieved 2019-04-22.